The recipe inspiration for this dish comes from a dear sweet friend. She delivered two pans of these delicious Chicken Enchiladas to my family at a time of need. They were such a welcomed meal that so warmed our souls at that moment (and have every time I’ve made them since). They are mild yet so full of flavor that they keep you coming back for more. Fill the tortillas with your favorite ingredients….what a great place to get creative. We love them with shredded chicken or pork that’s been slow cooked in the crock pot all day with onions & diced jalapeno, then we add flame roasted corn and shredded cheese and roll. You can add black beans, salsa, scallions, cilantro, more cheese… No matter what direction you take your favorite fillings….it’s the Enchilada Sauce makes this dish sing. The sauce comes together rather quickly, so it’s well worth the few extra minutes to gather all of your ingredients in advance. I also try to use nice rich homemade chicken broth whenever possible, but boxed works well too. And lastly, using ground toasted whole cumin seeds AND our newly dried oregano were incredible flavor boosters. Make this sauce…trust me, you will love it…and your spouse will call you a stud. I’ll take that. Place the chicken breast in a small-medium sized Crockpot. Top with diced onion, jalapeno, garlic, and seasonings. Cook on low setting for 6-8 hours until chicken shreds easily with a fork. Shred and reserve. Steam corn for 5 minutes, then roast in grill pan or over open flame, then remove from cob. Prepare all other optional fillings as desired. In a medium saucepan heat oil over medium heat, add flour, smoothing and stirring with a wooden spoon. Cook for 1 minute, then add chili powder and cook for 30 seconds. Add stock, tomato paste, oregano, and cumin. Stir to combine. Bring to a boil, reduce heat to low and cook for 15 minutes, stirring occasionally. The sauce will thicken and smooth out. Adjust the seasonings, adding salt as necessary. Serve atop your favorite enchiladas. In a large skillet, heat 1 Tbl. oil over medium heat. Add tortillas one at a time heating them on both sides just long enough to soften them. Fill with a couple spoonfuls of chicken & onion mixture. Then add roasted corn and shredded cheese and/or your favorite ingredients. Roll tortillas and place in a baking dish, seam side down. Continue until all tortillas have been filled. 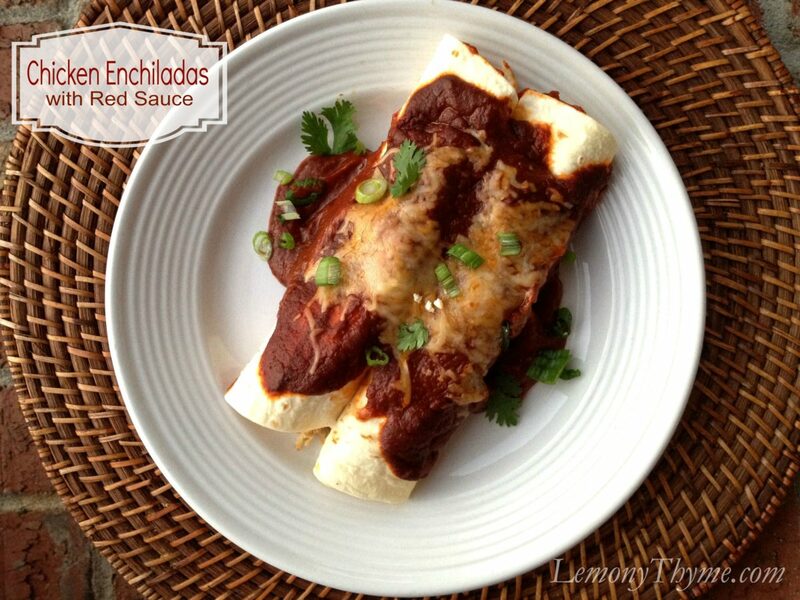 Spoon enchilada sauce over top of tortillas and sprinkle with shredded cheese. Bake for 15 minutes until cheese has melted and fillings are warmed through. Serve with sour cream, sliced scallions, and cilantro leaves. Wow, this looks amazing as well!! Could you make the sauce ahead of time and maybe freeze it or keep it in the fridge for a day or two? Yes, you can definitely make ahead and/or freeze it. The recipe is enough to make about 15-18 enchiladas. We actually used the leftover sauce over spaghetti and meatballs. Deliciously different.